The last two days in March the Potato Creek Bassmasters had our end of the year “Classic” at Lake Martin in Alabama. Sixteen members of the club qualified for this tournament by fishing at least eight club tournaments last year. We weighed in 152 keeper bass weighing 223 pounds. Almost everyone had a five-fish limit both days. Ryan Edge won with ten weighing 17.58 pounds, Kwong Yu was second with ten at 17.42 pounds, Raymond English placed third with ten weighing 17.16 pounds, my ten at 16.83 pounds was fourth, Tom Tanner was fifth with ten at 16.48 pounds and his 3.76 pounder was big fish. It was close! As usual, I had one bad day and one good day. I got back from the Top Six at Clarks Hill Tuesday and went to Martin Wednesday for one practice day on Thursday. I went to some of my favorite places that day and caught some decent fish on a spinnerbait so I decided to fish that way Friday. Friday morning started out frustrating. Everything I did seemed wrong, with many backlashes and no bites in the first two places I tried. I had heard the fish were biting pretty good until about 9:00 AM but very poorly after that, and I and not gotten a bite at 9:00! I started dragging a worm around, not the best way to catch quality fish most of the time, way earlier than I wanted to, and did manage to catch six small keepers and several throw-backs. But at weigh-in my five weighed less than six pounds and I was not even in the top half of the club that day. That night I decided to go for broke since this tournament is a one-shot deal. Most tournaments at Martin are won in Kowaliga Creek, far from where we start at Wind Creek, and I hate to make that long run. But I did, getting lost one time around some islands and thinking I was lost another time in the dim light. I finally made it to a rocky point where I have caught some quality spotted bass at first light but caught only two small fish. At 8:30 I headed to another point but slowed down to idle between two islands. I was not sure how deep it was and did not want to run aground. I am glad I slowed down. As I idled through the gap that turned out to be 18 feet deep I saw some fish on the bottom on my depthfinder. They were in a position that looked like they might be feeding, and wind blowing through the gap had created a slight current, always a good thing. There were also some brush piles and rocks in the gap. As soon as I dropped a swim bait to the bottom a two-pound spot hit it. I stayed in that gap for over four hours, catching close to 20 keeper spots between two and 2.68 pounds. 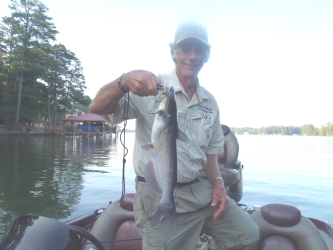 It was fun and they hit swimbaits, jig head worms, a jig and pig and a Carolina rigged worm. They were still biting when I left at 1:00 to try to find a kicker fish the last hour we fished. I really messed up at that point. At some brush piles known for producing big fish I got a bite on my Carolina rig but when I set the hook I broke my line. I was in too big a hurry and had not checked my line for nicks in it. I have no idea how big the fish was and I will never know. Lesson learned, again. Slow down and check your line! This entry was posted in Bass Fishing, Tournament Fishing on April 12, 2018 by ronniegarrison.